While we've seen a few storms move through recently, only one has produced what could be considered decent moisture. The others have been coming from the northwest, moving too fast, and have been followed by wind which basically nullifies the moisture benefit by sucking it right back out of the ground. March is traditionally our snowiest month, but this likely won't end up being the case given the pattern. This has to do with the overall global pattern and the particular phase that various oscillations are favoring. For those of you not familiar with those, here are a few important ones, and a basic understanding of what their various phases mean for us. 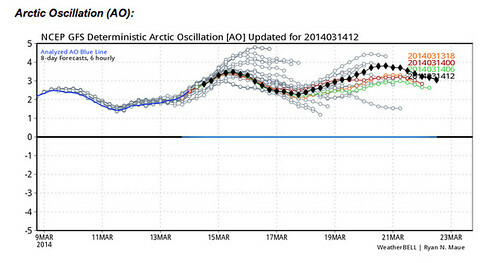 When the Arctic Oscillation is positive, it usually keeps the cold bottled up well to our north. As you can see, it is very positive and likely to remain that way through the later portion of this month. When the AO is negative, cold air can more readily be transported southward into the US and possibly Colorado. No sign of a negative AO appearing anytime soon, which means we will likely be pretty mild, with the exception of brief cool downs behind cold fronts. The North Atlantic Oscillation is currently in a positive phase. When positive, the overall weather pattern is very progressive. This means storms don't have much time to slow down, gather strength, and impact a particular area for an extended period of time. Sound familiar? Our storms have been very fast moving and have shown no tendency to slow down. 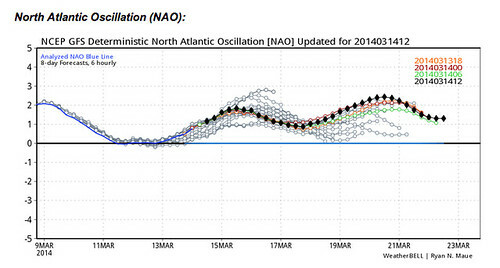 As you can see from the graph above, the NAO will likely remain positive through the later part of the month. When the NAO is negative, the weather pattern becomes much slower, gets backed up, and bigger, slower moving storms are much more common. The Pacific North American Oscillation is very important. Basically, it governs which direction our storms come toward us. When the PNA is positive (as it is now), our storms come at us from the northwest. This means they are usually fast moving, pack plenty of wind, not much moisture, and have no shot at tapping into the Gulf of Mexico moisture to really blossom. When the PNA is negative, our storms come at us from the southwest. These storms not only have lots of Pacific moisture to tap, but will also usually tap into the Gulf, and can be some of our biggest moisture producers. 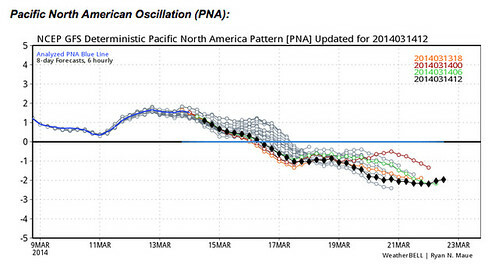 While the PNA is currently positive, there is a tendency for it to become negative by later in the month. This may change our weather pattern for the better, but I am not completely signing off on that improvement for a while. I want to see it happen firstâ€¦ Oh yeah, when the AO, NAO, and PNA are all positive, plan on temperatures being more mild than not. Bottom line, there is no access to any cold air when the three are locked into their positive phase. 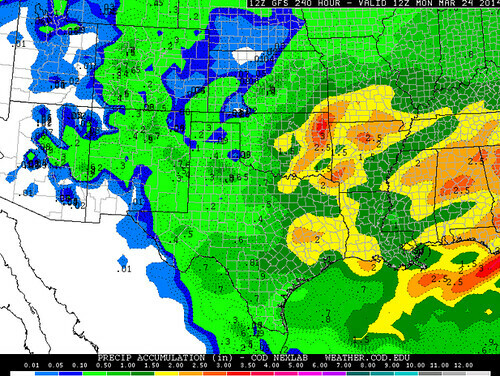 As you can see, not much moisture is forecast to fall east of the mountains through the 24th of March. The best moisture will stay quite a ways to our east, where it has been occurring for the past several months. No surprises here. 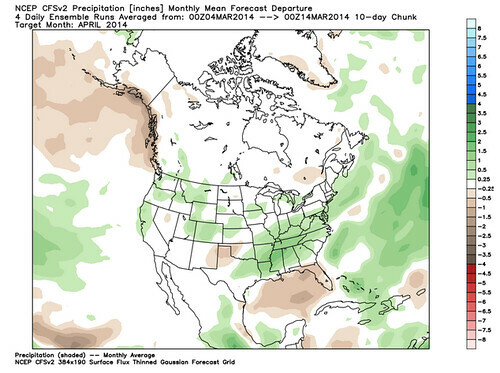 It does show wetter than normal (green shaded area) over 3/4 of Colorado, and keeps the Southeast Plains near normal. What does trouble me is the drier than normal signal in Eastern New Mexico and the Panhandles of Oklahoma and Texas. That could very well creep northward and impact Southeast Colorado. I would be lying if I said I wasn't concerned about that prospect. Areas farther north, have a much better chance of seeing better moisture in April, but my optimism should be viewed as cautious optimism. Please do the same. . . While I have focused on 3 very important oscillations in this article, I will focus on another very important oscillation in the coming days. That oscillation is called the Madden-Julian Oscillation and may be the most important one of all at governing moisture for Colorado. Until then, I hope you enjoy the content.